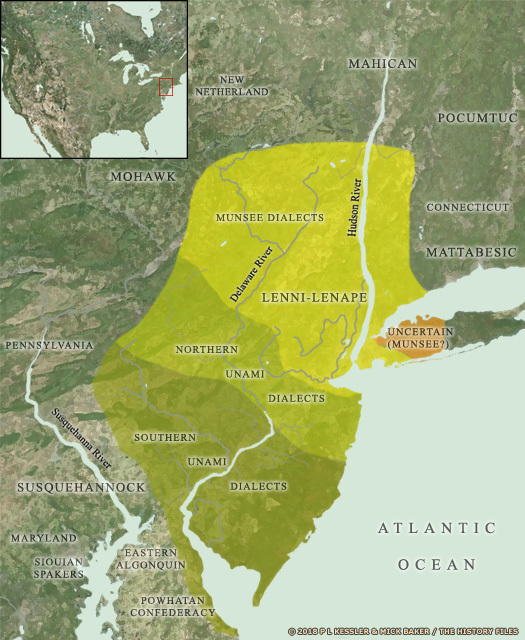 The Lenni-Lenape tribes lived in an area they called 'Lenapehoking', which means 'Land of the Lenape'. Their land included all of what is now New Jersey, eastern Pennsylvania, south-eastern New York State, northern Delaware, and a small section of south-eastern Connecticut. As part of the Eastern Woodlands, Lenapehoking contained a good many rivers, streams, and lakes, and was densely forested and rich in wildlife. The Lenape have been described as a warm and hospitable people. Their natural instinct was to be accommodating and peaceful, but this masked a temper which, if provoked, could react with terrible violence. Unami and Unalachtigo villages were generally not fortified but, due to their proximity to the Mohawk, the Munsee towns were. Villages were occupied during the summer with populations of several hundred. 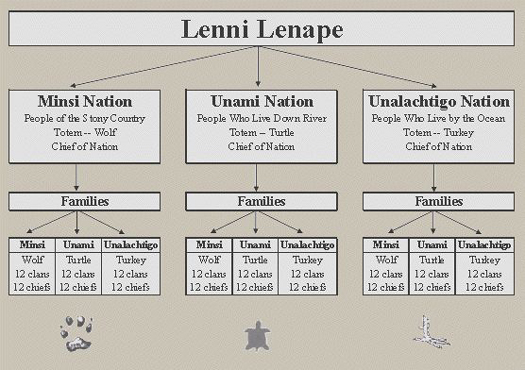 There was no concept of individual land ownership, but Lenape separated to defined family hunting territories (sometimes community owned) in the winter. Three types of wigwams were used: round with dome roof, oblong with arched roof, and oblong with a ridge pole. Dugout canoes were used rather than the familiar birchbark variety from the Great Lakes. Men did the hunting and fishing, but most of the Lenape diet came from farming which was solely the responsibility of the women. Corn, squash, beans, sweet potatoes, and tobacco were grown, and fields often covered more than two hundred acres. Men removed all facial hair and the women often coloured their faces with red ochre. Tattooing was common to both sexes. Older men wore their hair long, but warriors usually had a scalp lock greased so that it would stand erect. Although this hairstyle is often called a 'Mohawk', it was common to most of the eastern tribes. Lenape sachems wore only a single eagle feather and there was nothing that resembled the Sioux war bonnet. Clothing was made from deerskin, and decorated with shell beads or porcupine quills, feather mantels, and other ornaments. 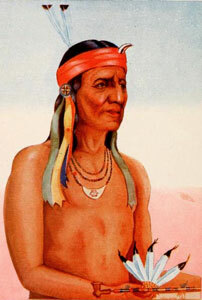 The Lenape used a lot of copper which they obtained from the western Great Lakes through trade. Hammered into ornaments, it was also fashioned into pipes and arrowheads. By 1750 the Lenape had become very stylish in their dress, favouring silver nose rings and clothing decorated with bright cloth purchased from European traders. There was no formal marriage ceremony, but the Lenape were usually monogamous. Religious ceremonies were centred around a dedicated 'big house'. Dreams were considered to be very significant, so Lenape priests were divided into two classes: those who interpreted dreams and divined the future; and those dedicated to healing. The dead were buried in shallow graves, but the methods used varied considerably: flexed, extended, individually, and sometimes even in groups. The Lenape believed in an afterlife, but without the Christian concept of heaven and hell - a source of considerable frustration for Moravian missionaries. Lenape were reluctant to tell strangers their real name, and the use of nicknames was very common. The real name of Captain Pipe, head of the Delaware Wolf clan in 1775 was Konieschquanoheel, meaning 'maker of daylight'. His nickname, however, was Hopocan, meaning 'tobacco pipe' - hence his historical name of Captain Pipe. Text and map copyright © Mick Baker & P L Kessler. An original feature for the History Files.